The group Agnatha consists of the jawless fishes, the most primitive group of living vertebrates. While most agnathan species are now extinct, fossil evidence indicates that the group was once highly successful and diverse. 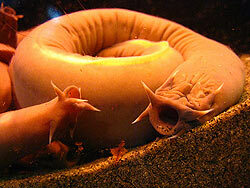 Two groups of agnathans have survived to the present, the eel-like lampreys and hagfish. Aganthans do not have hinged upper and lower jaws, instead they have unhinged circular mouths. They also do not have paired appendages like other vertebrates but have a tail and a caudal fin. The internal skeleton is made from cartilage and their body covering is skin. They also do not have a proper stomach, but have a long gut which is the same for its entire length. Many lampreys are parasites that use their toothed, funnel-like and sucker-like mouths to attach to a fish or mammal host. They use the many teeth in their mouths and on their tongues to shred the flesh of their host. Lampreys grow to a length of 13 to 100 centimetres. 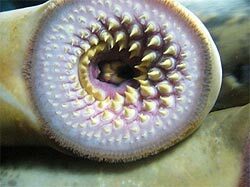 There are about 50 species of lamprey in the world. They are found in most coastal seas and many freshwater rivers except those in Africa. This is probably due to the fact that their larvae have a low tolerance for high water temperatures. 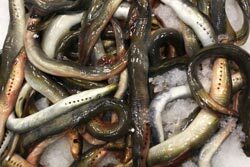 Most lampreys migrate in spring to the rivers where they were hatched. After migrating upstream the males build a rock nest-like structure, the females lay the eggs then the males release their sperm over the nest. Lampreys die shortly after spawning. Lamprey eggs hatch into small larvae (ammocoetes) which are not predators. Larval lamprey live in freshwater before undergoing metamorphosis and migrating to saltwater habitats. They do not have the sucker mouths of the adults, and filter feed for several years, before becoming adults, by producing strands of mucus and trapping food particles. Hagfish have elongated, eel-like bodies, and paddle-like tails but have no true fins. Their colours range from pink to blue-grey, and black or white spots may be present.Hagfish skin contains many slime glands, the slime is used for defence. It is thought that the sticky slime can reduce the functioning of a predator fish's gills. The average length of a hagfish is around 50 cm with the largest species reaching around 127 cm and the smallest about 18 cm. Hagfish are decomposers mainly eating dead animals. Their mouths have two pairs of horny, comb-shaped teeth on a cartilaginous plate that can move in and out. These teeth are used to grasp food and pull it inwards.